ROCCO E DANTE PALERMO CELL PHONE CASE..THIS WEEK SPECIAL 20% OFF! FOR THE WEEK OF DEC. 5TH, the Palermo cell phone case is now 20% off. Was $128, now $101.00This is a great bag for the gal on the go that does not want to carry a full size handbag. The Rocco e Dante Palermo cell phone case fits a smart phone, lipstick and your credit cards. 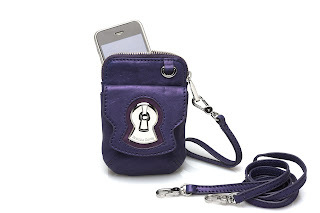 It comes with a removable cross body/shoulder strap and a removable wristlet. Perfect for a hands free walk in the park or to run errands. The case is made out of Italian leather with custom hardware. This piece is durable, functional and will be sure to get many compliments! To order please go to www.roccoedante.com and click on online store.